Choosing a first pet for your child can be a daunting task. A young child may not comprehend the needs of a pet or be able to recognize the proper way to handle one. And, with pets having much shorter life spans than humans, introducing a new pet may result in your child’s first experience with death. Yes, there are many important questions to ask yourself before making the commitment to bring a pet home for your child – Is my child old enough and responsible enough to have a pet? Will he be kind to the pet? Will he give the pet the attention and care it needs? What pet is best suited for him? Hamsters and Fish. If you have a toddler, it likely isn’t a good choice to introduce a pet such as a hamster or fish. Not only do they have short lifespans – which will inevitably lead to the explanation of death – they are small, fragile and require sensitive care. Yes, it may be a good learning experience, but always keep the animal’s safety and needs in mind. 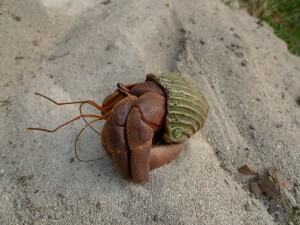 Hermit Crabs. Believe it or not, hermit crabs are actually an ideal first pet for a child. They are interesting, low-maintenance, extremely social and can live ten plus years with the proper care. And their regular molting and new shell growth will likely intrigue your child. Yes, a hermit crab is a great option for introducing your child to the world of responsible pet ownership. Rats. If you and your family aren’t the skittish types, a rat may be an ideal first pet. Though they come with a negative association, rats are actually quite intelligent, social, and easily tamed creatures. They often become emotionally attached to their humans and even enjoy a good cuddle. Despite popular opinion, rats are quite clean, when purchased from a reputable source. They can live up to two or three years, with proper care and exercise, and thrive when they have a rat companion by their side. Puppies and Kittens. Of course, when most of us think of a proper pet for our child, we think of a kitten or a puppy. Indeed, they are wonderful pets, but be conscientious of the fact that cuddly kittens and precious little pups usually aren’t an ideal choice of a first pet for a child. They require a lot of patience and training in order to grow into well-adjusted adults, and a child likely can’t fulfill that need. Sure, you can take on the task yourself, but do you have the time and the composure to handle a child and a fur baby? Instead, consider adopting a more mature dog or cat. Adult animals are typically more tolerant of children and have likely been trained to some extent, making it an easier transition into your home and into your child’s heart. A first pet can be a lesson in responsibility for any child. To ensure a pleasant experience for everyone – including the animal – be confident that your child is ready for a pet and do your research before making a pet choice. And, as importantly, be willing and prepared to take on the responsibility yourself, as any pet comes along with certain expenses (food, veterinary care, etc.) and requirements (regular feedings, exercise, training, etc.) that a child simply can’t handle. So glad you liked our article and found it helpful. Thank you for the comment!